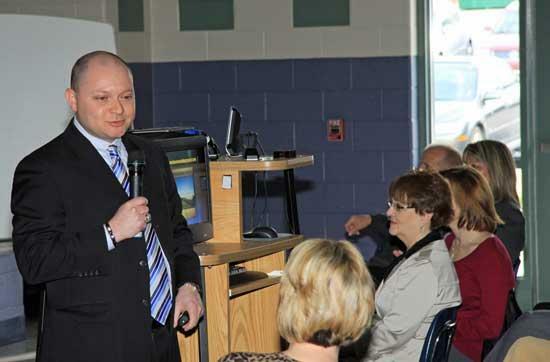 Leadership Expert and Cannon County native Micheal Burt addresses a group of local teachers and school administrators Tuesday. Micheal Burt came back to Cannon County Tuesday morning to give back to the community which gave so much to him during the early stages of his life. The Cannon County native and product of the local school system, who has enjoyed success first as the coach of a state championship basketball team and now as an author and motivational speaker, addressed around 100 teachers and school administrators at Woodbury Grammar School during a workshop session. Director of Schools Barbara Parker introduced Burt to the audience, and recalled the young man she knew while he was growing into an adult, and the accomplishments he has achieved since then. "I thought about what I could say about him, and so I thought 'I knew him when' and this is what I came up with," Parker began. "I knew him as a basketball player at Cannon County High School when he was dribbling all over the court and shooting long shots and driving all of the other teams crazy, before he became this state champion basketball coach. "I knew him when he was a student in my class sitting in the first row on the right because I always lined everybody up alphabetically from the right to the left and I would encourage him in his writing by saying 'you can write 500 words on this topic today', before he became this prolific writer. "I knew him when his picture was on a Beta Club t-shirt three inches tall running for state and national Beta Club office and practicing with him on his speeches, before he became this life-size billboard in Murfreesboro. "And then, I knew him as this cute, small little baby, whose grandma would bring by the courthouse where I worked when he was born and I got to hold him, before he became this nice, young, good-looking man." Burt's speech to the teachers and school officials was sponsored by FirstBank whose local president, Wanda Parker, was in attendance. "Teachers can have the single greatest impact on our society as any group out there," Burt said, "and until we get the teachers engaged and fired up about their own lives its going to be very difficult to get the students fired up. "The principals I am teaching are from my third book, 'This Ain't No Practice Life.' How do you bring it every day? How do you bring that energy, enthusiasm, passion for what you do and how do you see a bigger picture versus the academic content you are teaching? How do you teach a child to win in life? "You do that by affirming and validating their confidence, their self worth," Burt said. "You teach them that they can become whatever they want to be, that they hold the keys to their own car. They're not the passenger of their life, they are the driver. That's the first step. "Then you have to start asking yourself these questions: What do you love doing, what are you naturally talented at, and how can you make money doing what you love and what you are good at?" In addition to being a motivational speaker and leadership expert who has addressed thousands of people across the country, Burt has also authored or co-authored a number of books including, "Changing Lives through Coaching, "The Anatomy of Winning," "The Inspirational Leader," "This Ain't No Practice Life," and his latest, "From Here to Anywhere - Unique Habits of Successful Teams." The co-author for two of Burt's books, including the latest, is another Cannon County native, highly-successful former Shelbyville High and current Middle Tennessee State woman's basketball coach Rick Insell. An indication of how highly Burt uis thought of as a speaker is the fact that he has been asked to speak, for the third time, by the Women's Basketball Coaches Association at the Women's Basketball Final Four in San Antonio, TX in April. With clients ranging from Ole South Properties, John Jones Real Estate, FirstBank, and many more. Coach Burt's spring plans include a book with Personal Growth Expert Stephen Covey titled "Success Simplified," go on a 15 city tour for the Better Business Bureau on "Building Businesses in ANY Economy, host a local workshop series at The DoubleTree Hotel, and finish his fifth book to be released in March. Burt specializes in goal cultivation, people development, leadership enhancement, and culture building. To learn more go to www.hearcoachburtspeak.com. "We learn the most when we teach to others. Thanks to the elementary teachers of Cannon Co. for having me speak today. Great group!," Burt posted on his Web site following Tuesday's visit to Woodbury.